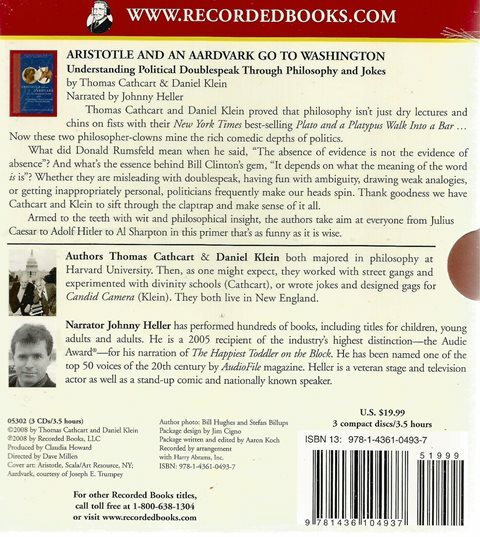 Aristotle and an Aardvark go to Washington (CD) by Thomas Cathcart & Daniel Klein two excellent philosopher-comedians return just in time to save us from the double-speak, flim-flam, and alternate reality of politics in America. Deploying jokes and cartoon as well as the occasional insight from Aristotle and his peers, Cathcart and Klein explain what politicos are up to when they state: “The absence of evidence is not the evidence of absence.” (Donald Rumsfeld) Drawing from the pronouncements of everyone from Caesar to Condoleeza Rice, Genghis Kahn to Hillary Clinton, and Adolf Hitler to Al Sharpton. Cathcart and Klein help us learn to identify tricks such as “The Texas Sharpshooter Fallacy” (non causa pro causa) and the “The Fallacy Fallacy” (argumentum and logicam). 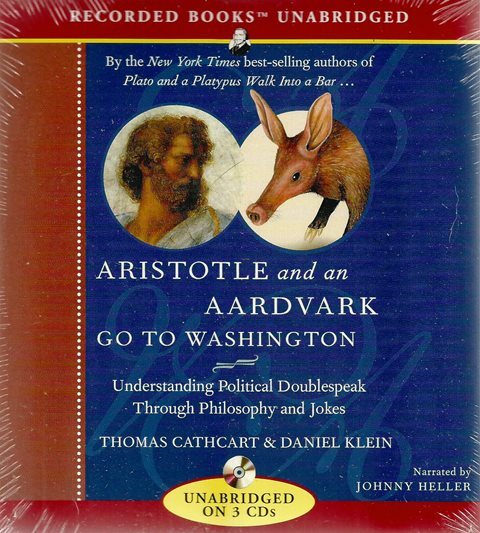 Aristotle and an Aardvark is for anyone who ever felt like the politicos and pundits were speaking Greek. At least Cathcart and Klein provide the Latin name for it.